Continuing my quest to try all the Michelin Star restaurants in New York City, I was intrigued by Casa Enrique, a Mexican place located in Long Island City. Some may ask how come Long Island City, also called LIC, can be considered part of NYC: know that some of its neighborhoods are located in Brooklyn, a borough of NYC. At least, besides stuffing my face with a Mexican meal, I learned something...Anyway, Casa Enrique, the restaurant of Executive Chef Cosme Aguilar can show off one star, already a good accomplishment. What is interesting, is that there seems to be a gap between a one and two stars: you will find lots of casual restaurants like Casa Enrique in the one star category, but certainly not in the two stars section where Daniel, The Modern or Marea share the fame. Yes, Casa Enrique is a popular casual place and I was glad we had a reservation because it was packed. When we arrived, they proposed to sit us in the garden, as long as we would be out at 8pm. No problem! Sitting in the garden was slightly less noisy than in the dining room and, although covered, it was nice to be outside on a beautiful day. Jodi simply went for their lemonade. 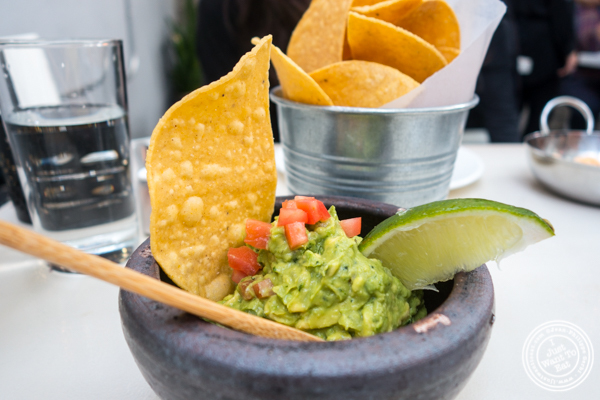 Then, we shared the guacamole, our must have dish when eating Mexican cuisine. The delicious freshly made guacamole was served with homemade totopos that are similar to tortilla chips. For her entree, Jodi opted for the enchilada Doña Blanca that was composed of roasted chilies poblanos and onion, rolled in corn tortilla, tomatillo sauce, lettuce, black beans, crema fresca, queso fresco, and avocado. It was one of the few vegetarian dishes on the menu, choices being limited. On my side, I originally wanted tacos, but, when I saw the Chamorro de Borrego al Huaxamole or lamb shank braised in chile pulla peppers, huajes (aka river tamarind) and epazote (herb also called Mexican tea), I could not resist. The dish was beautiful, the sauce having a nice red color thanks to the peppers that were not that spicy, but you could feel the heat building up slowly. The lamb was superb, literally falling of the bone. It was served with rice and beans as well as tortilla. Last was dessert and we did not hesitate: we ordered their tres leches that was one of the best we ever had! The sponge cake was totally soaked and there was a nice amount of goat's milk caramel. This was a very good meal and I would definitely go back to try their tacos. 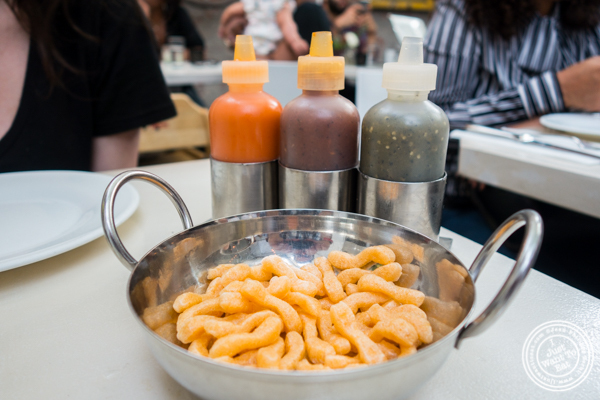 Casa Enrique is worth a trip to Long Island City!